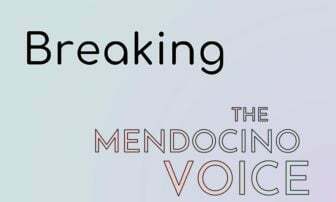 MENDOCINO Co., 2/28/18 -- The Mendocino Women's Political Coalition will be honoring three Mendocino women at their Women's History Gala this year on Sunday, March 4 at the Ukiah Saturday Afternoon Club. Three women, Josefina Duenas, Ronita French and Angela DeWitt, have been selected as award recipients under the theme "Never the less she persisted: Women who fight all forms of discrimination." The event will also feature speakers Sarah Lingren and Malia Cohen, and performances by Breath and the Inland Valley Women's Chorus. 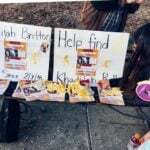 The gala starts at 12 noon on March 4 at the Saturday Afternoon Club at 107 S Oak Street in Ukiah, and is co-sponsored by the American Association of University Women Ukiah Chapter and Ukiah Saturday Afternoon Club. Tickets are $10 at the door. For more information call 895-3543, and everyone is welcome. 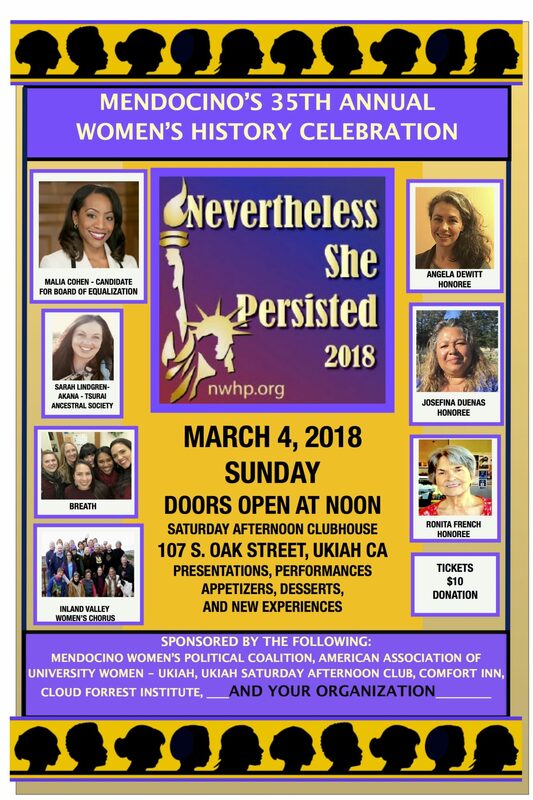 On Sunday, March 4, 12:00 p.m. doors open at the Saturday Afternoon Clubhouse, 107 South Oak Street, Ukiah for the 2018 Women’s History Gala. "NEVERTHELESS SHE PERSISTED: Honoring Women Who Fight All Forms of Discrimination" is the theme for this year's event. We will honor 3 women who personify this theme: Josefina Duenas, Ronita French and Angela DeWitt. Josefina Duenas, who became deaf at the age of one, has persisted in the face of prejudice both against the disabled, and against immigrants from Latin America. 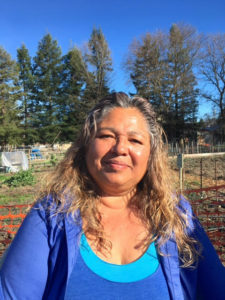 Besides publishing a free monthly bilingual newspaper, Josefina is an active volunteer at the Mendocino Environmental Center, recruiting young Hispanic programmers to work at KMEC radio. By assisting in Red Cross disaster response, Josefina brings comfort and assistance to the Hispanic community. But her true love is her work at the Community Garden, with 60 other families, encouraging others to eat and live healthy. 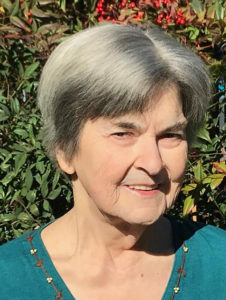 Despite the numerous health challenges she and her family have overcome, Ronita French has served the people of Mendocino County throughout her life. Early on as Matron in the women’s jail, she worked tirelessly to create humane treatment for women, and to gain unequal pay for equal work. She served as a long term volunteer for the Cancer Center, and presently is the longest serving Senior Peer Counselor in our County. She believes she receives more than she gives in her volunteer work. 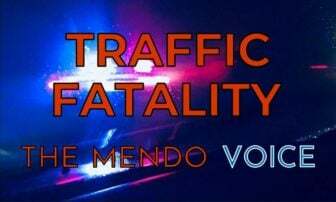 Angela DeWitt is a first responder and Captain of the Anderson Valley Fire Department. Angela was born into a firefighting family in Yorkville, and through persistence and passion to serve the people in her Anderson Valley community, she has been recognized for her strong leadership. 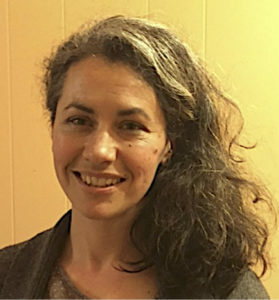 The other side of her determination to make a difference is her work with the Anderson Valley Housing Authority, where she has focused on housing for low income families and individuals and farm workers. The mission of our inspirational speaker Sarah Lingren is to protect and maintain the identity and culture of the Tsurai people. When attempts were made to place a lighthouse on their sacred land, she rallied the tribe to resist. 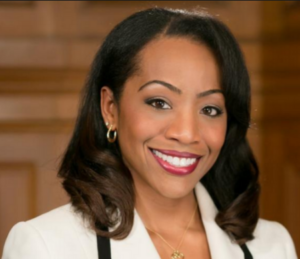 candidate for the State Board of Equalization. Breath and the Inland Valley Women’s Chorus will sing compelling songs of social justice. 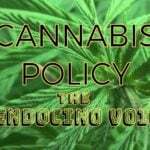 Appetizers will be served at the beginning, dessert will wrap up the afternoon. 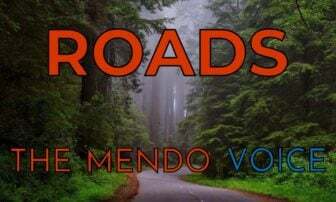 Sponsoring this annual event is the Mendocino Women's Political Coalition (MWPC) with AAUW-Ukiah, and Ukiah Saturday Afternoon Club. You will have the opportunity to win unique prizes and sign up to enjoy fascinating New Experiences. Everyone is invited to attend this historic celebration; $10 tickets at the door. 895-3543.